There are 88 posts in this topic. You are on page 1 of 2. I know what Marco and the other part sites say, but do you have the right legs on your machine? I was curious whether I did, as we often get sets of legs rolled up from people when we purchase games. I didn’t see any threads after a quick search, so I just thought I would throw this out there out of my curiosity, and whether anybody had input I was unaware of. For instance, I recently picked up an Allied Leisure Getaway and a Spooksville. Wrong legs are commonly given by sellers along with AL games. Most games (Bally, Stern, Williams, DE, etc.) 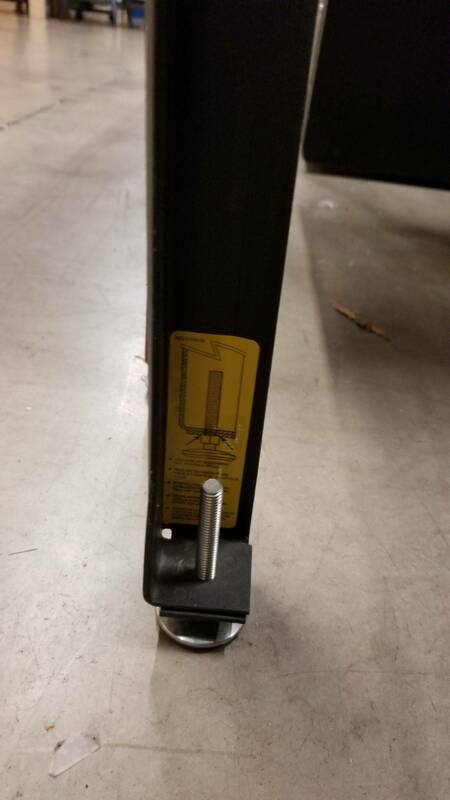 have 2 1/4” spacing between the leg bolts, from center to center. 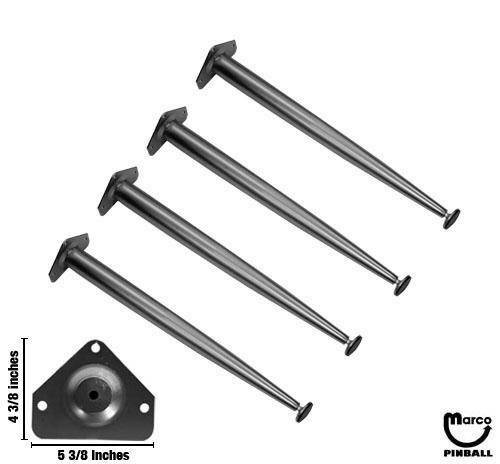 AL legs, however, have an abnormal 2 1/2” spacing between the leg bolts, from center to center. So if you try to put “regular” legs on an AL game, all you will do is get them in on an angle and strip out the receivers. And AL legs are 29 3/4 tall, with partial ribbing. I have been fortunate that all the legs were OEM. However,I put a new set of 27 inch Williams on a Gottlieb and liked the lower stance. I would like to lower all my machines, buts that another subject. Sega 31”, no rib. Are they all black? All of my games have the right legs and the left legs. I find it works better that way. I put 31" on the backs of all mine. AL legs, however, have an abnormal 2 1/2” spacing between the leg bolts, from center to center. Just went to look at them though, and they aren't ribbed, and are only 28" long. So I'm still confused. 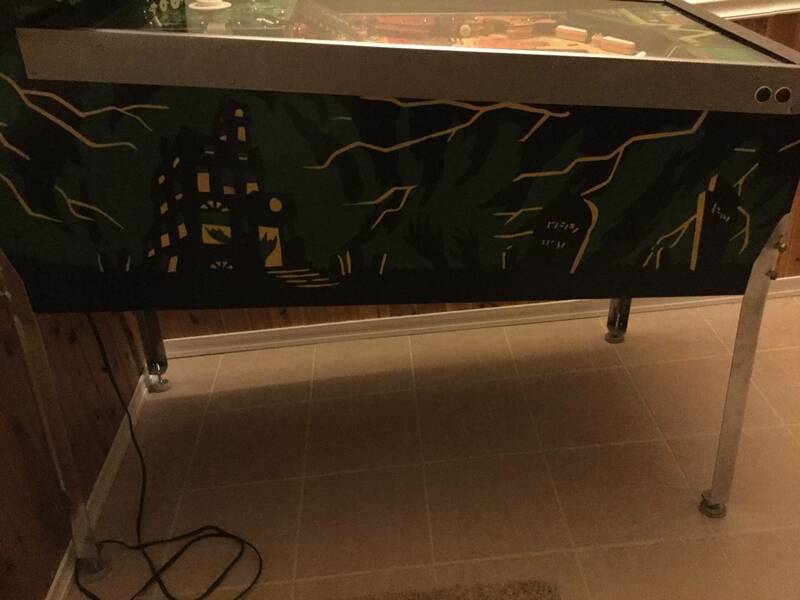 Some games definitely sit better with different legs on them, especially Gottlieb Premier games. Those things tend to sit 5 feet off the ground and up to your chest while you flip. Do I see "Ghosting" on that AL where other legs may have been at one time? Gamatron is Pinstar, not AL. But I can’t say for sure which legs go with Gamatron. Hopefully that’s the purpose of this thread. So we get definitive answers. However,I put a new set of 27 inch Williams on a Gottlieb and liked the lower stance. 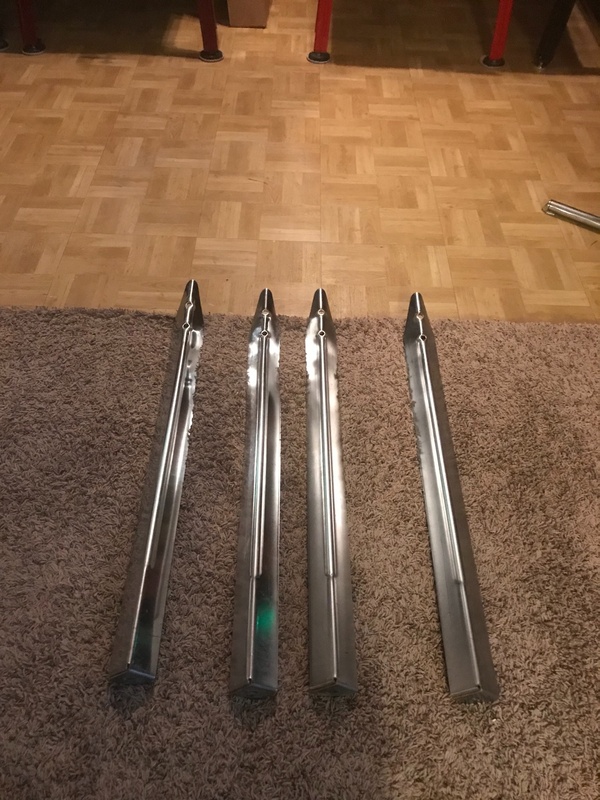 So all Williams SS games, at least late 70’s and early 80’s, had 27” legs? And non-ribbed? 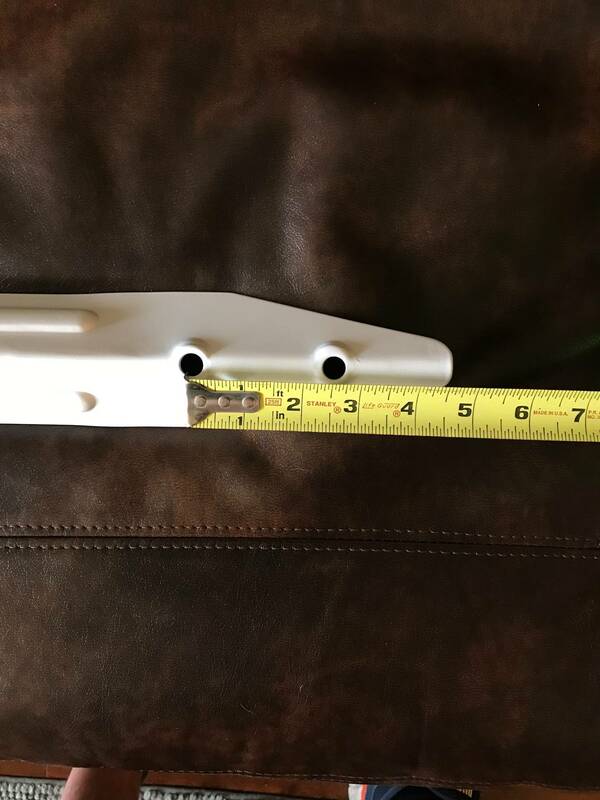 WPC 28 1/2” full rib. Also Bally alphanum and DMD? I believe black out of the factory on all Atari games. I have chrome on right now, original black legs are off for powdercoating. Ha ha........yeah so I can throw them right in the trash. Pretty sure my PZ has the wrong legs - no ribs - but in 5 years I haven't been sufficiently motivated to take action to correct it. 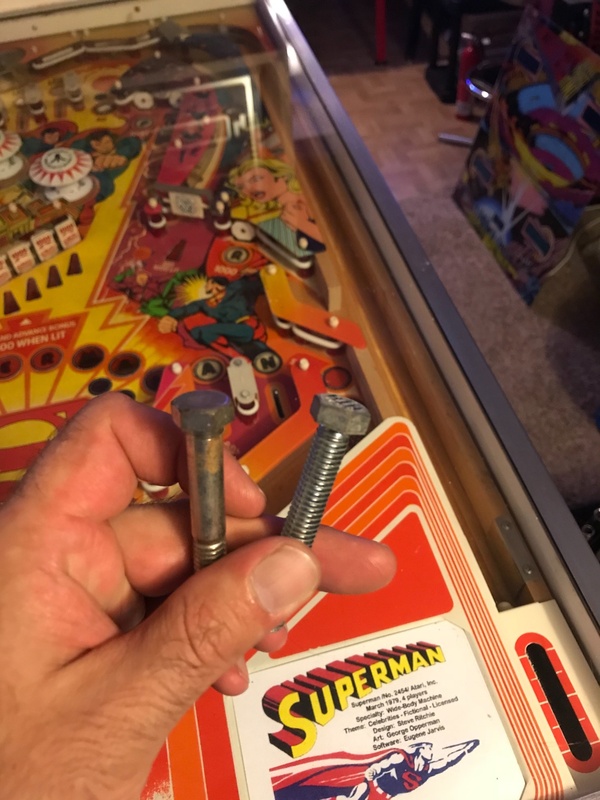 I do swap out bolts when they are wrong. the WPC style legs are also on my SWE1 and I think that's correct for Pin2k. 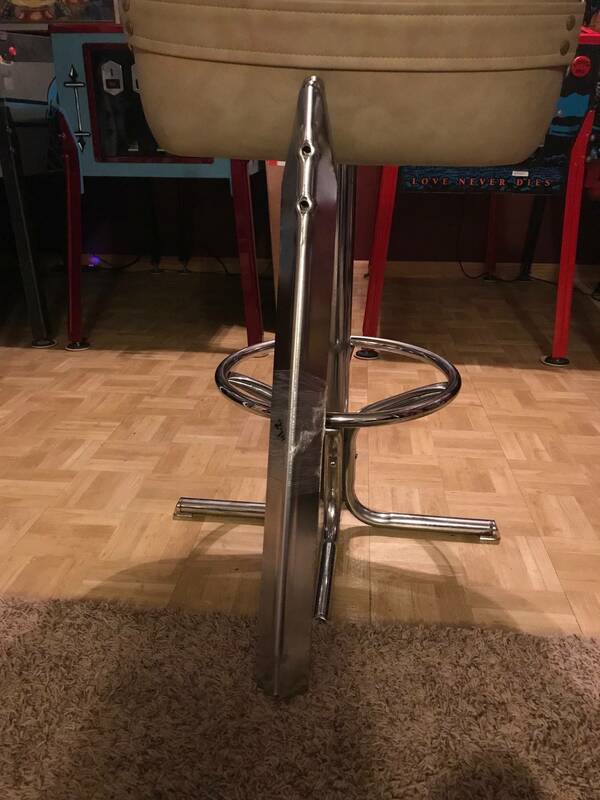 Some legs you just can't get correct replacements for, especially a lot of older Williams games, and rarely show up for sale used, so sometimes you just gotta make do. Pretty amazing these are available though. For a one year run of games. 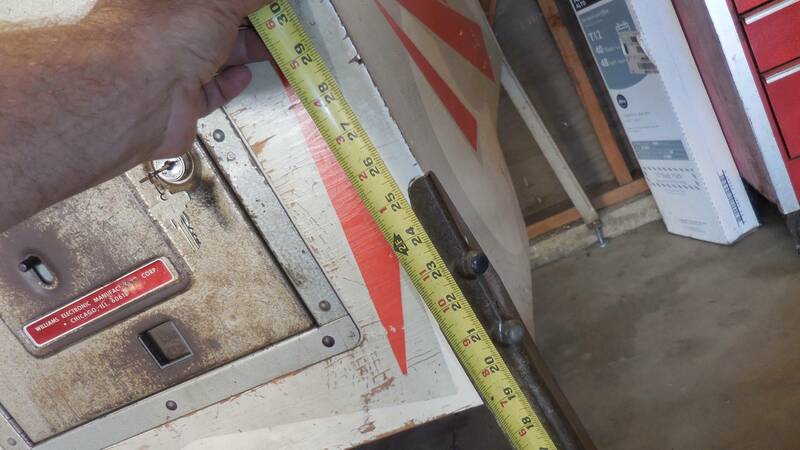 And 24 7/8”....odd size. I’ve never even seen those before. 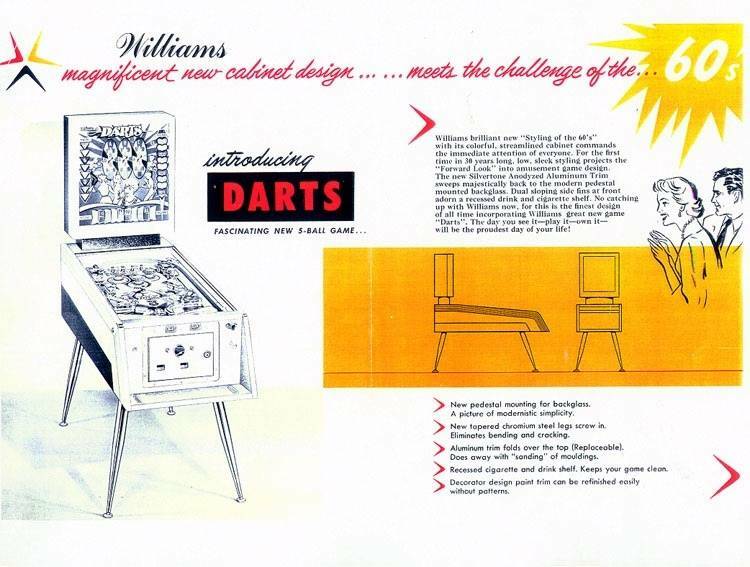 Fits the "styling of the 60s cabinet" starting with Darts. Only used for about a year. Thing is, those games usually have the correct legs on them. Can't get any reproductions of Williams legs prior to that and several after that. Now if you have a Gottlieb instead, you're all set. I have 4 of these 31" chrome non-ribbed from a Williams Laser Cue I bought. 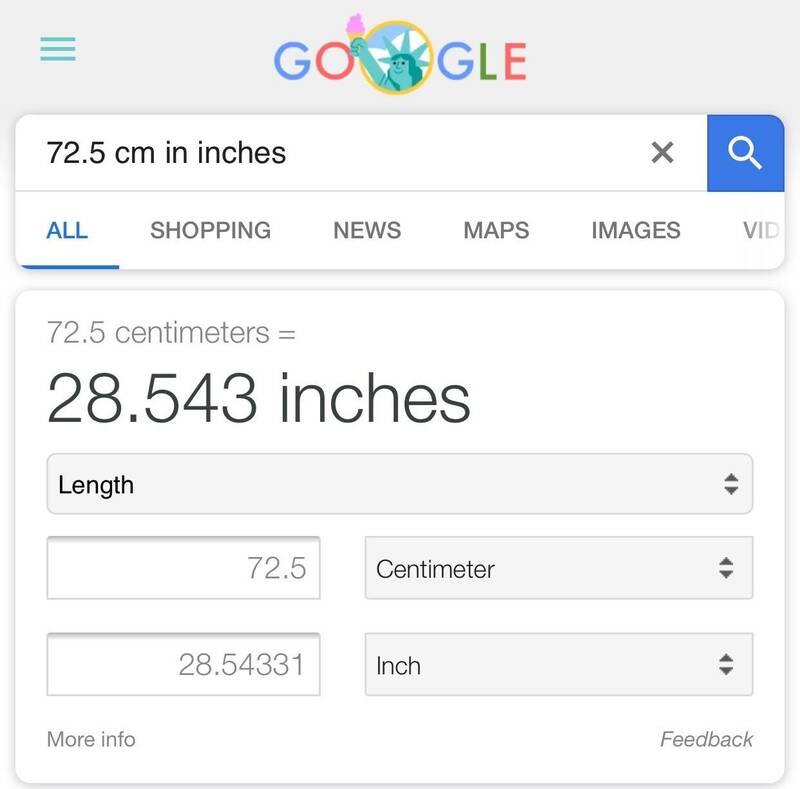 I don't know if they are correct. Instead of having to jack up the leg levelers on one of my pins I like real steep I put a pair of these on the back. Works great. Might be the same legs used on Williams shuffle alleys. I actually never knew United and Williams were in bed together. Yup. 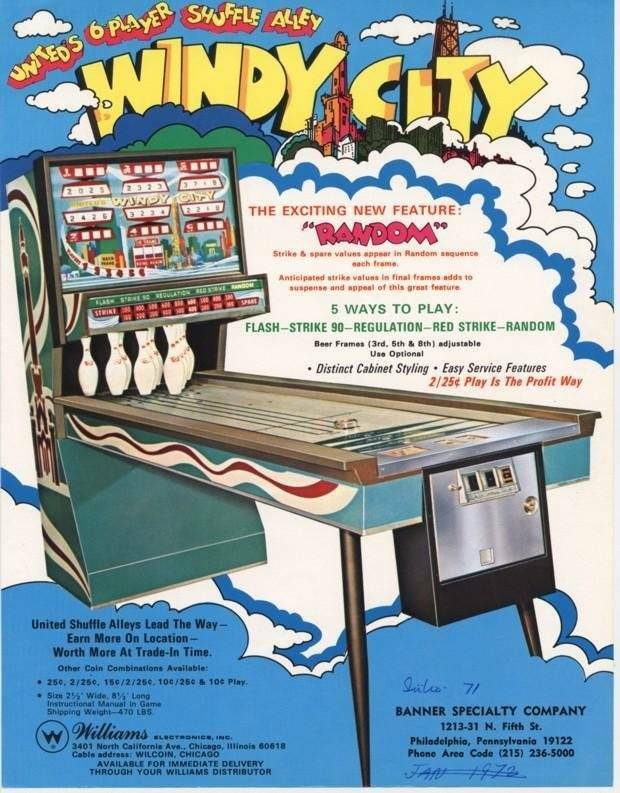 Williams kept the United name on their shuffle alleys up to the early 80's I believe. Looks like the same Williams coin doors also. Wrong legs on a game really bug me so I always source correct. 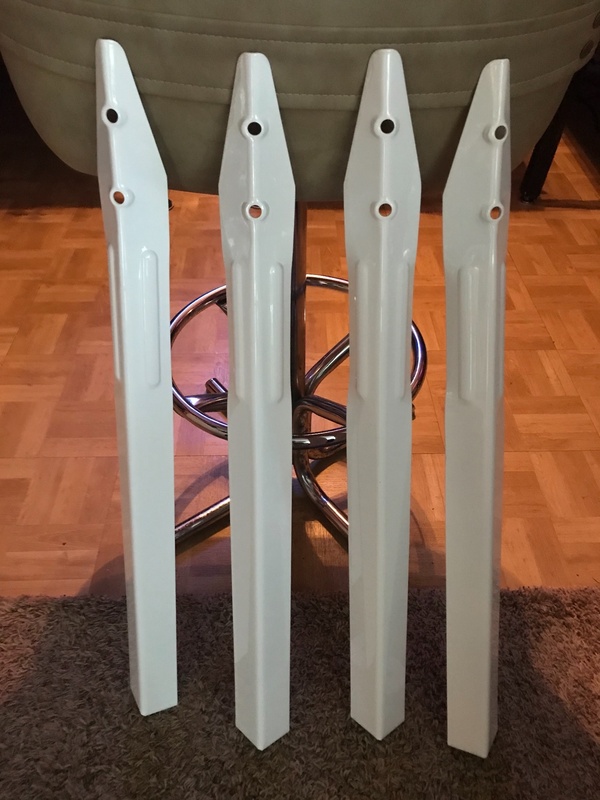 Are all classic Stern legs, non ribbed, with kind of a factory silver powdercoating? 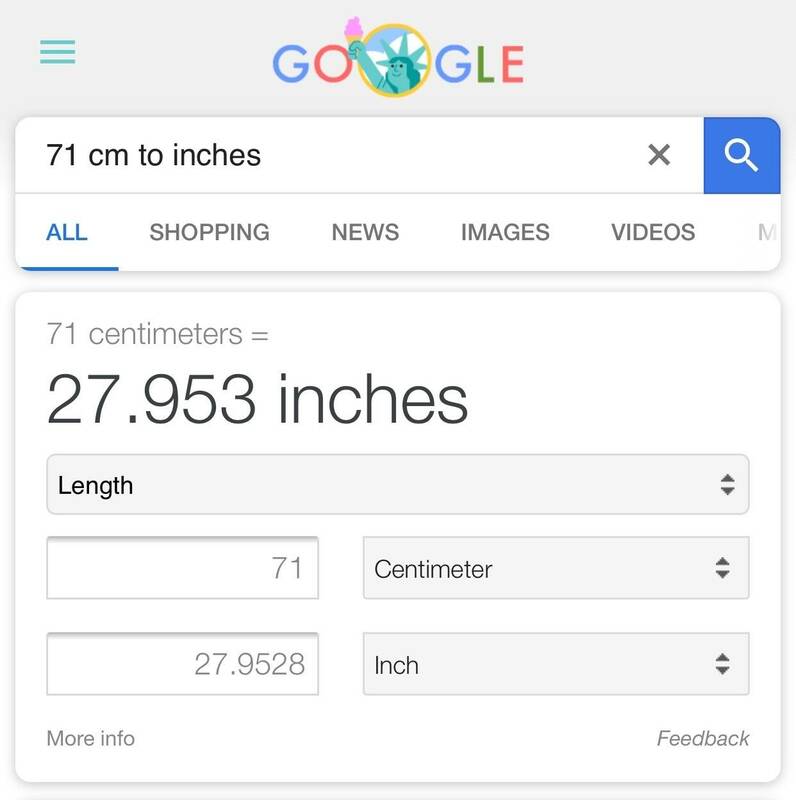 Also the amount of woodrails that have incorrect legs is huge! 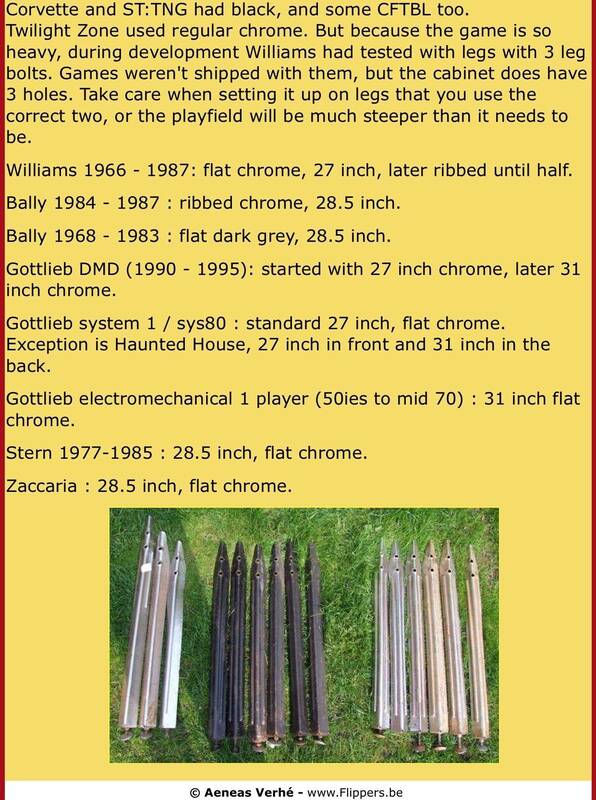 Hmmm I best check this out, I was planning on buying a new set of black legs from STERN for my Goldeneye restore. I assumed the legs would be the same, but I best check they will fit before ordering. Midway used something very similar on their vacuum gun games. If enthusiasts are annoyed with legs, stop encouraging new owners from using powder coat, off color paint schemes, and chrome. Especially, when they are using the wrong type of legs in the first place out of lack of knowledge, particularly EMs. It decreases the resale value, the game will play incorrectly, and it looks like crap. 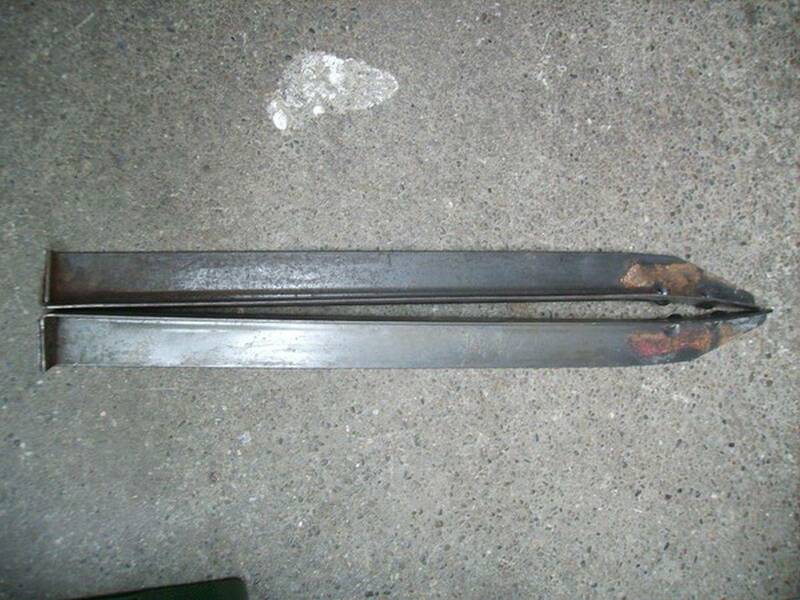 It is also, pretty sad when the front of the legs are polished and shiny, and the back of the legs are full of rust. 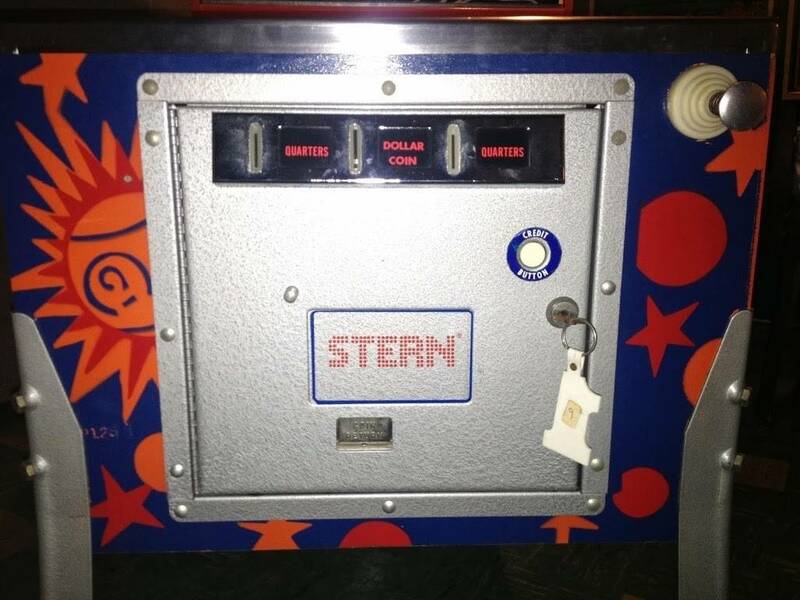 I recently saw this along with a full chromed coin EM coin door, but the inside was all rusted to hell, including the coin returns. 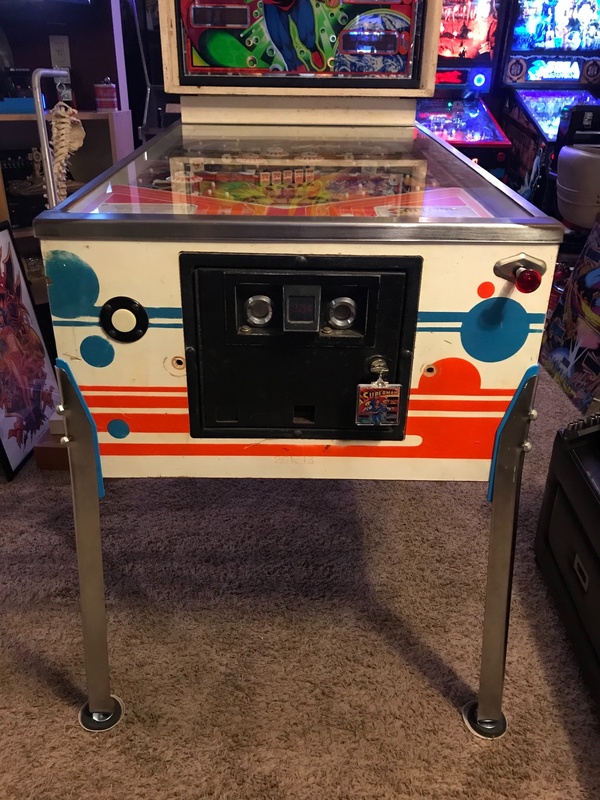 The owner did not seem to happy to find out he spent a lot of money chroming the wrong type of legs to match his coin door, and yet the rust was all over the back side anyway? Mechanics are more important than cosmetics in ALL games, definitively. If doing a restoration, people should do a bit of research beforehand and actually finish the job, not do things lazily or not check others work if they opt to have someone else do it for them. Yup...factory legs for Classic Stern games were all 28 1/2”, non-ribbed with a gray/silver color. I have the right legs on my machine. I have the left legs on it too. mike_m beat you to it in Post #5 above...so you don’t have a leg to stand on. I’ve never owned a Goldeneye, but I’ve had quite a few Sega games. I think my BF had ribbed legs, but I’m not sure if they were correct. 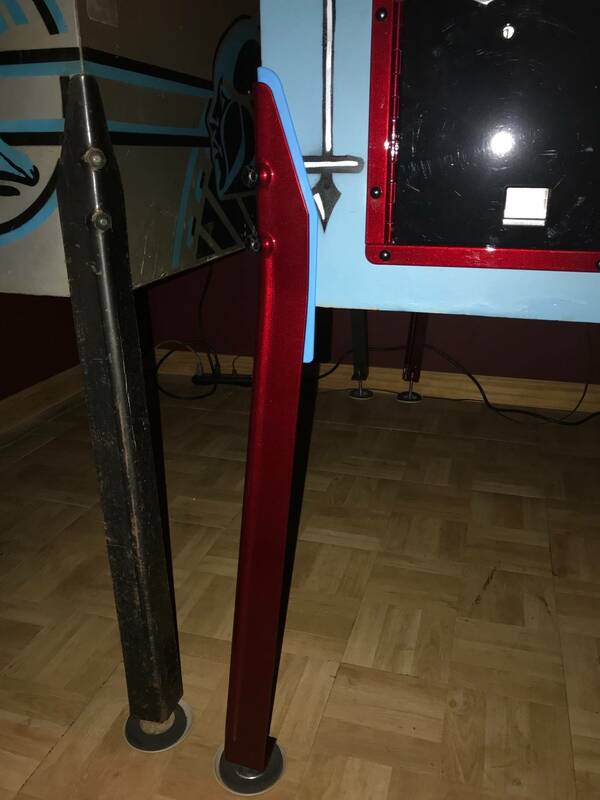 Stern legs on new games are full-ribbed, and 28 1/2”. (My old MET below, which I bought with low plays from a guy that bought it NIB). I would check your Goldeneye and see where the leg bolt receivers are situated. 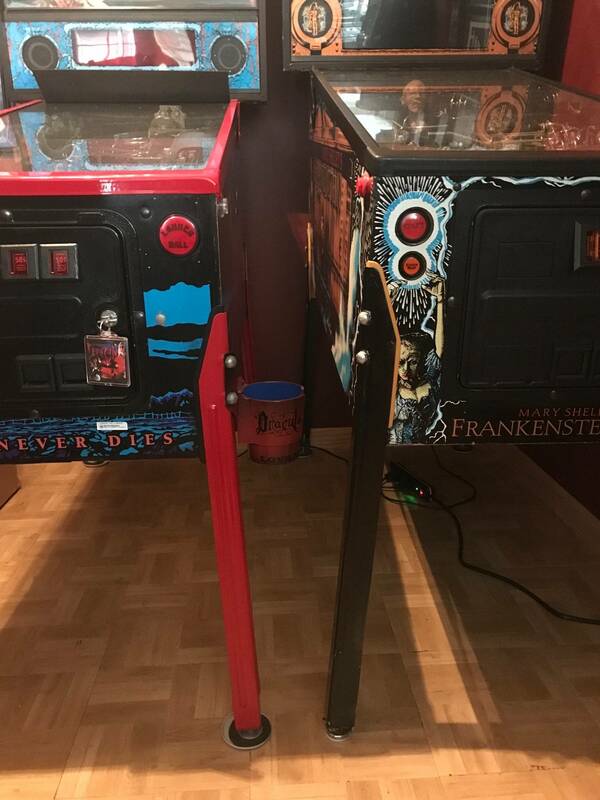 WPC games also use 28 1/2 inch, but as you can see on my BSD next to the Frankenstein, the leg bolt receivers on MSF are further up the cabinet. Hence the 31” legs. And both games are relatively still the same height for play. It decreases the resale value, the game will play incorrectly, and it looks like crap. Other than “playing incorrectly” somehow, assuming you mean the wrong height, the rest is a matter of opinion. I don’t think there is anything wrong with powdercoating if that is your preference, or if your original legs are rusted or in horrible shape. Powder makes them look brand new. 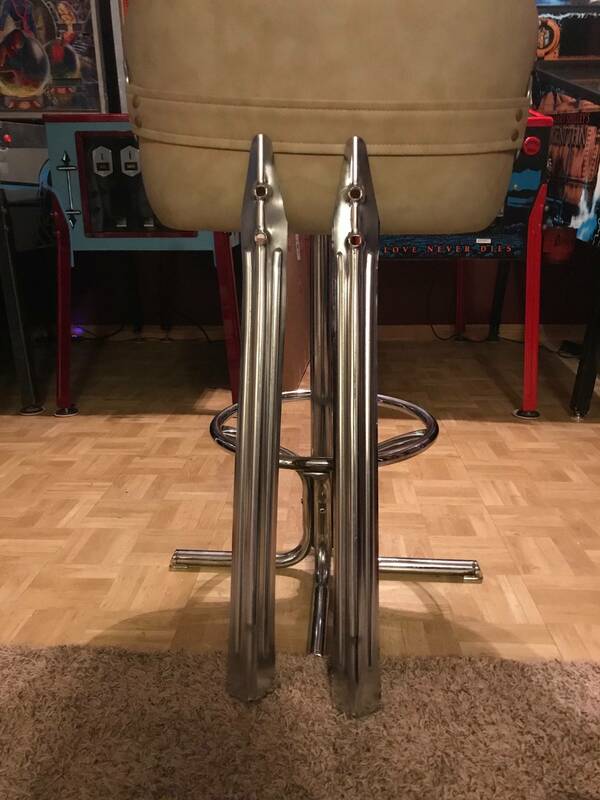 polished and shiny, and the back of the legs are full of rust. In my experience, a ton of people don’t refurbish the back legs, given that they are usually tucked away and not seen in a lineup. But I couldn’t agree more. 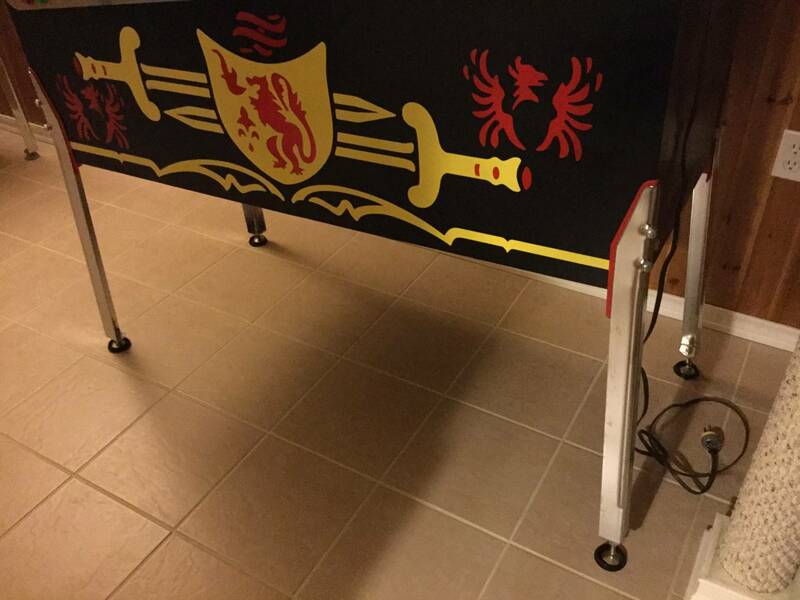 If you are going to refurbish or restore legs and the coin door, do the whole thing. Right from the manual on IPDB...30 1/4” but look like they are supposed to be full-ribbed legs. So perhaps the 31” on my Frank are a hair long/not correct? Now I’ll have to dig out my manual. Don’t really care about style as long as they are the correct height. I hate playing a game that’s up to my armpits or down to my knees. Colson, if you do not remove those plastic things from between your cabs and legs someday you will sorry. Why is that? I don’t put them on cabs with decals....for those I properly use the Stern metal standoff protectors. Some people on this site love bashing the plastic protectors. 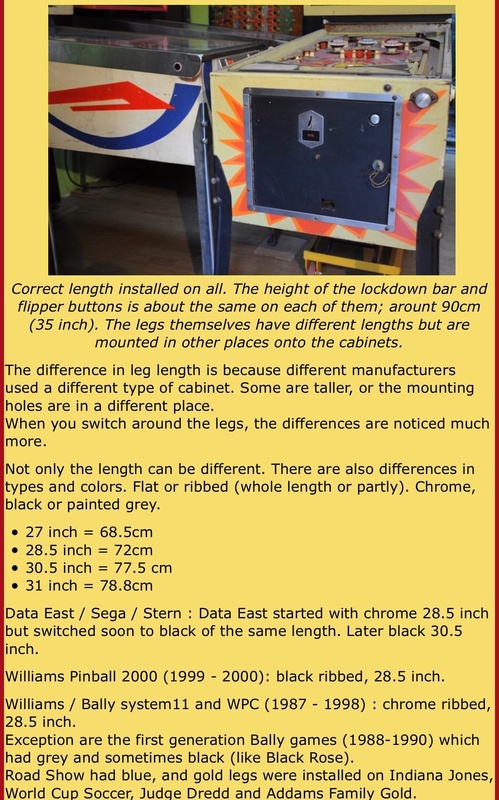 But tell me, how would a piece of plastic do more damage to a cabinet than the metal legs themselves? That makes absolutely NO sense. If people don’t like the aesthetics of them, that is their opinion and I can at least appreciate that. 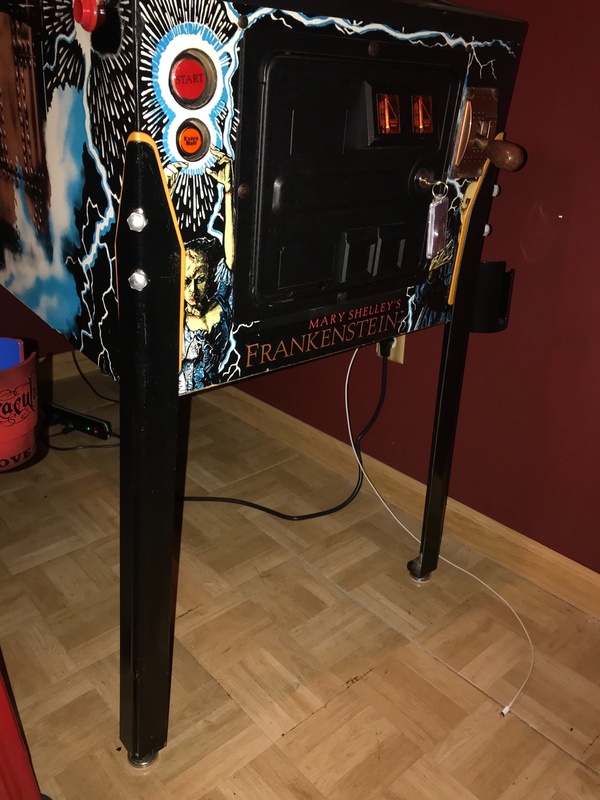 I have taken a ton of legs off games with these protectors, with no damage to the cabinet at all. Even after years. 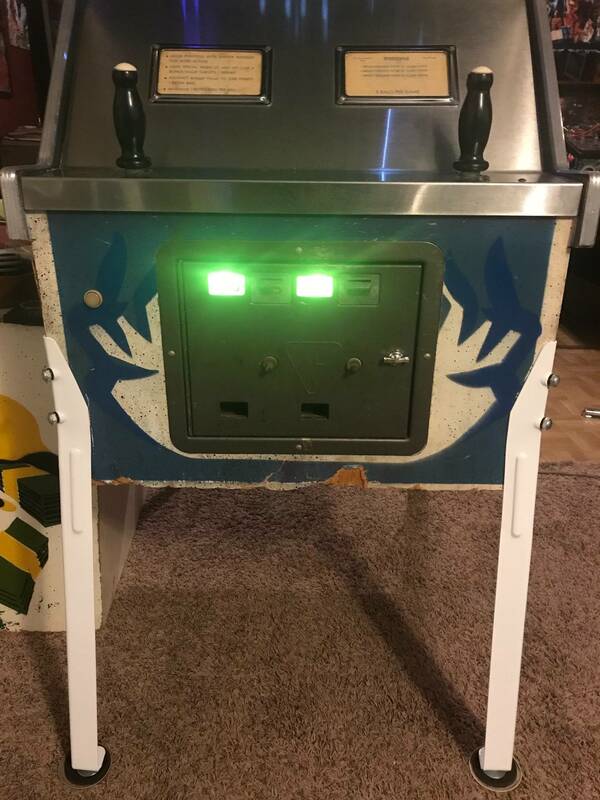 On the contrary, I have picked up several games with just the metal legs attached that had severe damage from the legs digging into the cabinets, being shifted around and being over-tightened. Thought you had decals on. Sorry. 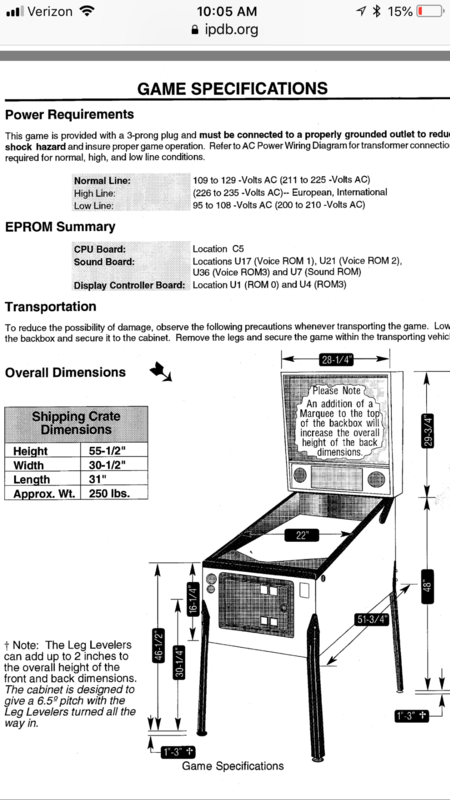 I would love to see some of this info preserved over at pinwiki. 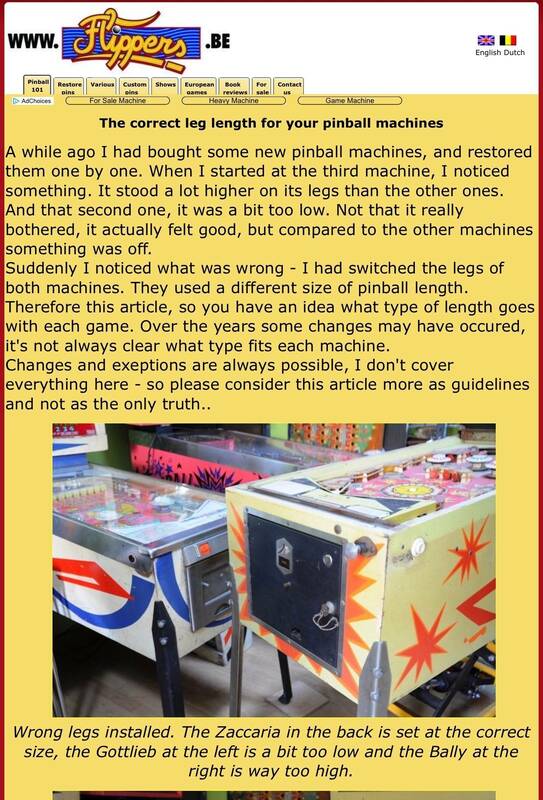 http://www.pinwiki.com/wiki/index.php?title=Pinball_Leg_Guide is basically a skeleton of info right now. Good idea. 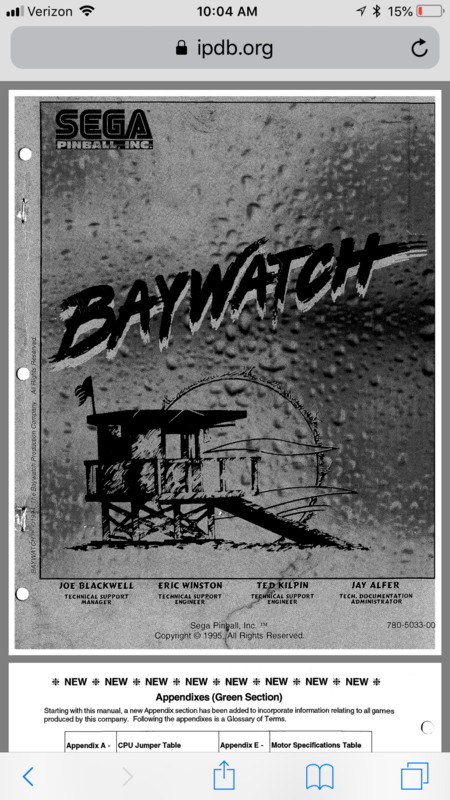 When I have some time, I’ll transfer the bulk of the information over from here and the flippers site. No worries. For decaled cabs as I said, I agree. 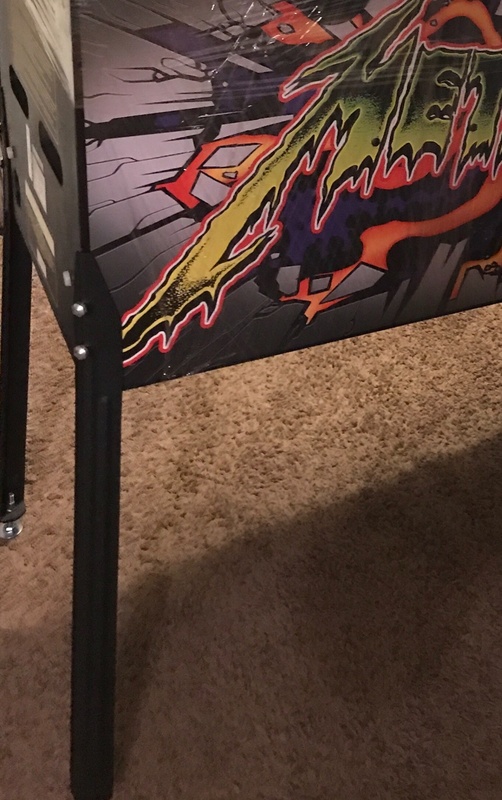 I don’t think Sega put out any games that had decaled cabinets. 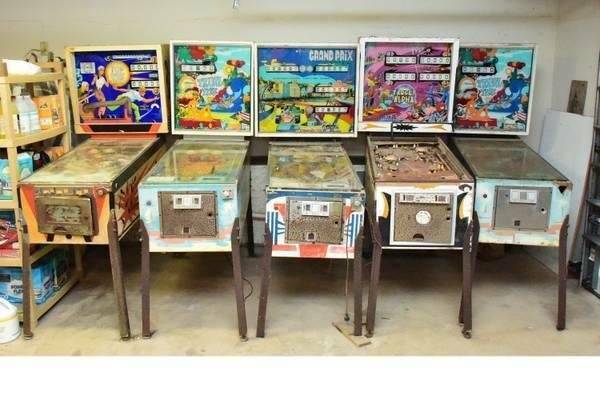 I’ve just seen and heard other people making those comments as to painted cabs with the plastic protectors, but it’s never backed up with any sensical or logical argument. Plastic certainly cannot do more damage to a cab than metal would. I may be in the minority, but whether the game has the exact correct legs is not an actual concern of mine. As long as I can get the machine leveled and it's at the right height, I'm good. I do like the legs to match, so 4 correct ones or 4 incorrect ones that are identical I'm happy. There are lots of things to worry about in life and this isn't one for me. 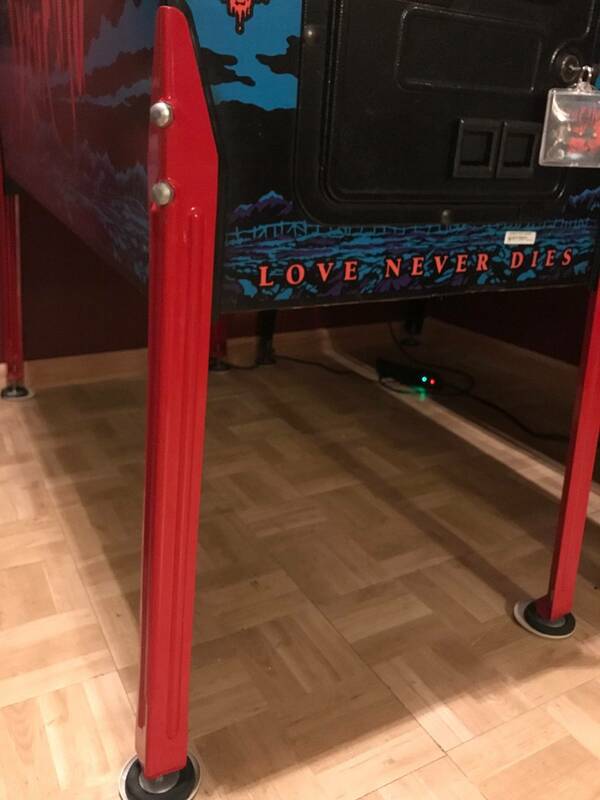 Stern legs on new games are full-ribbed, and 28 1/2”. Early Sega legs are documented as 30-1/4", but are actually 30-7/16". The rib is there, but it is not as pronounced as on current Stern machines. The tool that made these legs is long gone. 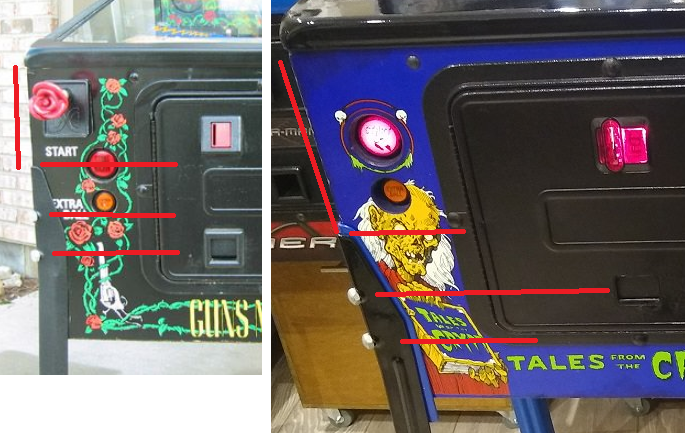 If you need to replace the legs on an early Sega machine your only option is to use Stern legs. Exactly when the switch from the older style to the newer style was made I do not know, but it was sometime during Sega's run. 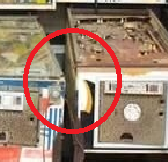 To be sure your early Sega machine has the correct original legs, check for this sticker on the inside of the leg. This picture is taken of the leg on my documented HUO Baywatch.